read the history of our business and how we reached clients all over the globe through our site. We live on a hunting ranch in one of the remote areas of Namibia, in Africa. Namibia is a country in Southern Africa, just northwest of South Africa. 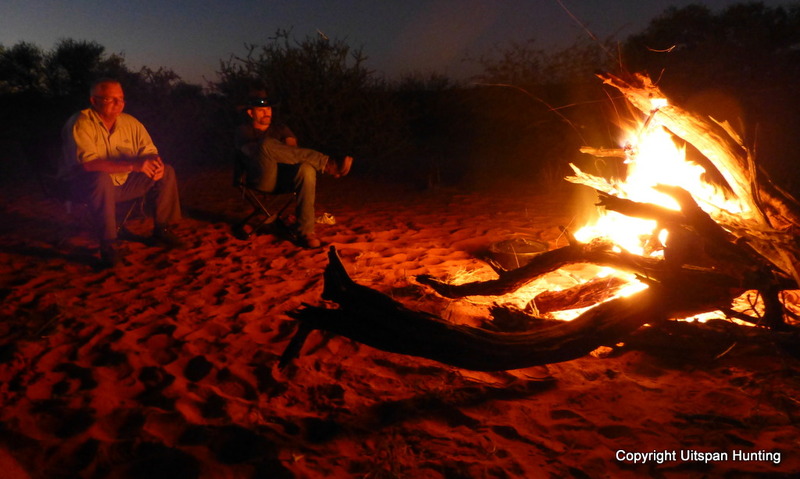 The region where Uitspan Hunting Ranch is located, is also known as the "Kalahari Desert". It is a wonderful, adventurous and exciting place to live. Our father, Hendrik, started the conservation of certain plains game animal species on Uitspan Ranch years ago. During the years we saw these herds growing and it strengthen our love for nature, the Kalahari and all the species now to be found on the ranch. In the last decade more and more hunting guests visited the ranch (introduced by different outfitters, friends or family). We learned to love the encounter with people from all over the world who share our love for the outdoors. 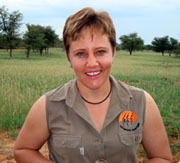 All our visitors were astounded with the special experience hunting in the Kalahari offered. We decided that we want to make hunting and accommodation of guests our business – additional to our farming activities. Uitspan Ranch is 105 km (65 miles) from the nearest town, doctor, shop, church and school. To live a bit remotely like this, has a lot of advantages. The disadvantages are that we didn’t have running electricity, automatic telephones and tarred roads for long years. Power lines were built about three years ago and we got an automatic satellite telephone two years ago. You can imagine that we didn't had much knowledge of computers and other related things like the Net – due to our previous circumstances. So how could we run a business, reach clients and hunters all over the globe - from here? The most famous way for African hunting outfitters to advertise is to visit shows (exhibitions) in the USA and Europe to meet prospective clients and to sell hunting packages. Since our children are still very young and the ranch needs a lot of care and attention during the warm summer months of January till March (the exact months during which the outdoor shows are hosted), Michael and I (read more about our family) decided that we need a more suitable way of advertising. The Web was the logical choice... we could reach millions! Our website never ranked high at the search engines like Google, Yahoo, Ask or Live. We never knew how much traffic our site got. It was very difficult to keep our site updated with new pictures, info and news. It costed us N$7,500.00 (Namibian Dollars) that first year for the design and running on the Net. It would have costed us N$3,500.00 for every year to come (and that can not even be compared to what business-owners are charged thesedays!). The site was about our business, but... not exactly "us". How could we change all of these problems we had with our website (which is our most important marketing tool)? I realized that our business needs US to build our own website, BUT... I didn't have any technical knowledge of computers, the Net and website-building! There are thousands of online website building software available... what to use? What provides the best quality service at the most affordable price? I read a lot about SBI (Site Build It), and liked it more and more since it seemed to suits our situation so perfectly. The idea started growing on me and then... we took that final step and ordered the website building software of SBI. Well, I did not know the HOW yet, but I took that leap because I really were motivated to learn everything about e-business. I didn't know HTML or had any technical knowledge of website-building at the time. .With SBI I can work on our site wherever I am, whenever I have time, at my own pace. This was our best investment ever (for less than a third of what we had to pay previously). SBI's website building software took me on a great, enjoyable and absolutely amazing journey of learning to make a local business successful online. (If you cannot make the decision about what you can make a website about, SBI even helps you to choose the best NICHE for YOU! SBI and its president, Ken Evoy, over-deliver in every way. It includes EVERYTHING you need for a successful online business and gives excellent service for all its owners. I have never been part of such a friendly and eager-to-help group of people than the owners on the SBI Forum. This forum helps out with ANY question or difficulty you may experience during the process of building your website. Even the most common questions are answered here in a detailed and professional way. I am so fortunate to do something every day that I really enjoy: sharing my love and passion for the outdoors and hunting, our beautiful Kalahari and its animals – with people everywhere in the world. It is wonderful to be able to change data, info, pictures of recent hunts and everything else on our website – just with a few clicks... here in our own home. Our business is growing even when we sleeps..;-) since SBI's website building software is managing all the technical stuff that goes with a website. Creating our hunting business’ website is one of the most rewarding things I have ever done in my whole life. SBI helped us to get targeted TRAFFIC to our website. How do I know? I see on my traffic stats that people use Google, Yahoo, Live and other search engines for our keywords ... and FOUND US near the top! We get a lot of enquiries from hunters from all over the globe. Hunters are booking hunts with us through our website. In recent years, we were most privileged to accommodate clients from Russia, Slovakia, United Kingdom, Hungary, New Zealand, Australia, Portugal, France, South Africa and USA. We are doing business - even though we haven't had the opportunity (due to circumstances mentioned above) to visit shows and exhibitions in person. We may visit global clients and markets soon. However, these expensive ways of advertising are, because of our site's Web success, not as essential for our business like for most other hunting and safari outfitters - but merely optional. And what could any website want more than WEB SUCCESS? to Expand Our Business' Income-Generating Website. Even if you don't know what some of these things are (like I didn't know before), rest assured that SBI's website building software will coach you every step of the way. They also manage and handle a lot of the technical jargon for you in the background. You can focus completely on quality content - and that is what visitors to any site are looking for! Worried that building a website is too complicated for you? SBI's Action Guide presents a step-by-step process, presented in both written and video formats. All you have to do is follow it. Really! The most successful SBI! owners say "all they did was follow the Guide". They don't get sidetracked, or have to guess at what to do next. This website building software's guided approach helps you reach your goals. If YOU want to generate income online...Just Give it a Go! Do you realize that your business or even hobby and pastimes can generate a solid income on the Web? YOU have a special knowledge, understanding, passion, life and interest in SOMETHING. Use it to build your own website. And for this I can honestly recommend SBI's website building software. If you are a motivated person and like challenges – this is for you. If you follow the easy action steps given by SBI, you will have success. Why wait when your success is guaranteed? Get on with building your business. The sooner you start, the sooner you'll get results.